A child, filling up drinking water container, supplied via tankers due to water shortage in the country. At its fundamental level, a government’s role is to ensure its citizens have access to the basic necessities for survival. In countries where water shortage is a prominent issue, this means adequately managing water supplies to prevent drought. It also means investing in water infrastructure to distribute water to citizens across the whole country. Iran’s climate means water management is of the utmost importance. With an annual precipitation depth of just 250mm, far less than the global average of 850mm, Iran is among the driest regions in the world. Despite this, the clerical regime has grossly underestimated the importance of effectively managing the country’s water supply. Experts believe that Iran’s water management is approaching crisis point. 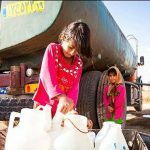 The People’s Mujahedin Organisation of Iran (MEK) has called the water crisis one of the six “super-challenges” Iran faces. The country is already racked with drought, and the situation is set to worsen in the coming years. 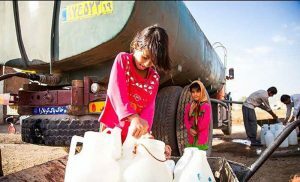 According to the MEK, 3,000 villages in Sistan and Baluchistan lack any source of drinking water. 1,200 communities rely on water trucks to deliver their fresh water. The Chief Executive Officer (CEO) of Iran’s Water Resources Management Company predicted that the drying of the Lar and Latyan dams will leave swathes of Tehran’s Eastern suburbs without electricity for more than seven hours a day. The government has done little to prevent this crisis. It has issued warnings but has been markedly absent in taking steps to avoid such a crisis developing. They could have invested in renewable “freshwaters”, a step that other countries facing drought often take. What little water Iran has is often wasted. Urban water usage is higher than it needs to be. As is the water used for agricultural purposes. Of the 130 million mm2 of freshwater in Iran, 92% of it is used in agriculture, far higher than the global average of 70%. Only 6% is set aside for urban and rural consumption. The regime blames the people for Iran’s water shortage. It cites high consumption in Tehran and wasteful domestic water habits. This is how the regime justifies its frequent water price increases. However, even if the regime is correct, and citizens in Tehran are not careful with their water, domestic consumption accounts for just 6% of the country’s total freshwater. It is the regime’s waste of the other 94% that has left the country in a water crisis. Experts have indicated that the underlying cause of Iran’s water crisis is not the people, but the regime’s inappropriate distribution and mismanagement of water resources. The UN believes that excessive dam construction and inefficient agricultural practices must shoulder the blame. Outdated watering techniques employed in Iran’s agricultural sector create excessive water waste. There are options for alleviating Iran’s water crisis. The first would be ending the corruption pandemic that is entrenched in the Iranian regime’s management of water and food resources. The regime is far more comfortable blaming the Iranian population for the water crisis than taking responsibility for its own mismanagement and systematic plunder of Iran’s natural resources.